NASA’s Land Ocean Temperature Index (LOTI) data for April. CREDIT: NASA. The Alaskan tundra is warming so quickly it has become a net emitter of carbon dioxide ahead of schedule, a new study finds. Note 1. Since CO2 is the primary heat-trapping greenhouse gas — and since the permafrost contains twice as much carbon as the atmosphere does today — this means a vicious cycle has begun that will speed up global warming. Note 2. The permafrost, or tundra, has been a very large carbon freezer. For a very long time, it has had a very low decomposition rate for the carbon-rich plant matter. But we’ve been leaving the freezer door wide open and are witnessing the permafrost being transformed from a long-term carbon locker to a short-term carbon un-locker. “This is ancient carbon,” Dr. Commane told Alaska public radio. “The carbon that’s locked in the permafrost in the Arctic is thousands and millions of years old.” Note 5. Thawing permafrost can release not just CO2, but also methane, a much stronger heat-trapping gas. While most models that include thawing permafrost look at CO2, Russian scientists have recently discovered some 7,000 underground bubbles of permafrost-related methane in Siberia. Note 6. Since methane traps heat 86 times more effectively than CO2 over a 20-year span, these findings suggest that the effect of the thawing permafrost is even greater than first thought. Also, a 2008 study, “Accelerated Arctic land warming and permafrost degradation during rapid sea ice loss,” found that rapid sea ice loss — as has been experienced since the study was published — could triple the rate of Arctic warming. Note 7. Meanwhile, the rapid Arctic warming that is fueling these emissions continues. On Monday, NASA reported that April 2017 was the second-hottest April on record — only April 2016 was hotter. Note 8. As the map above shows, Arctic temperatures were blistering, up to 13.5°F (7.5°C) above the 1951–1980 average. The longer we delay aggressive climate action, the harder it will be to stuff all the toothpaste back into the tube, and the more catastrophic climate impacts we will face. This post has been updated for clarity. Dr. Commane reached out to ThinkProgress to make clear that this process would not lead to a runaway greenhouse effect, but would exceed any increase in CO2 uptake from the increase in plant matter expected in the region due to climate change. Note 4. Chris Mooney, “‘We all knew this was coming’: Alaska’s thawing soils are now pouring carbon dioxide into the air,” The Washington Post (8 May 2017). Note 8. 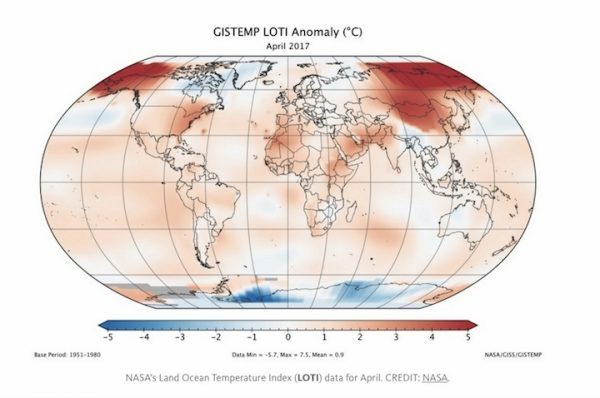 GISTEMP, “April 2017 Was Second Warmest April on Record,” NASA (15 May 2017). Joseph Romm, Ph.D., is one of the country’s most influential communicators on climate science and solutions. Romm is Chief Science Advisor for “Years of Living Dangerously,” which won the 2014 Emmy Award for Outstanding Nonfiction Series. He is the founding editor of Climate Progress, which New York Times columnist Tom Friedman called “the indispensable blog.” In 2009, Time named him one of its “Heroes of the Environment,” calling him “The Web’s most influential climate-change blogger.” In 2009, Rolling Stone put Romm on its list of 100 “people who are reinventing America.” Romm was acting assistant secretary of energy in 1997, where he oversaw $1 billion in low-carbon technology development and deployment. He is a Senior Fellow at American Progress and holds a Ph.D. in physics from MIT.